The Pittsburgh Penguins like to promote from within. When longtime goaltending coach Gilles Meloche resigned from his role last June, it was logical to assume that goaltender development coach Mike Bales would be promoted as his replacement. But the Penguins decided to interview other candidates in June…and July…and August. By early August the team had narrowed their search down to three rumored names: former backup Brent Johnson, Swedish goalie guru Erik Granqvist, and Bales. A few weeks later, they hired Bales. A number of fans asked why the Penguins would waste two months interviewing random goalie coach candidates when they probably already knew Bales was their guy. That time was crucial, they argued, for getting Marc-Andre Fleury back on track after his playoff disaster against the New York Islanders. My response was that the interview process was actually the early stages of developing a gameplan for Fleury. One of the dirty little secrets in sports management is that some front offices drag out interview processes to gather as much intel as possible from around the league. In short term, LaFontaine will work with BUF asst GM Kevin Devine but has short list of GM candidates and the search for fulltime GM is on. Why did Pat Lafontaine’s self-described “short list of candidates” swell to over 10 before settling on Tim Murray? Imagine the insight they probably gathered over the course of two months — and remember that “they” indirectly included Bales as well. The other secret is that Fleury didn’t just reinvent his game this season. It’s been a work in progress over the past few seasons — incorporating a little bit of Jonathan Quick, a dash of Semyon Varlamov, and a heavy dose of mental fortitude. In order to truly appreciate how far Fleury has progressed, let’s first remember where he’s been. Fleury’s puckhandling gaffe late in Game 4 of the Pittsburgh-Columbus series wasn’t even the worst of his career. Fleury’s active style got cranked up to hyperactive mode when the Penguins went on the road in the playoffs for the first time since 2001. He seemed to end up in the corner after each save, scrambling to challenge every shot from potent weapons like Spezza, Heatley, and Alfredsson. Ottawa toyed with him — they threw cross-ice passes back and forth until Fleury melted down. The Senators cruised to an easy five game series victory. Fleury’s peaks and valleys since that moment are well-documented. His Stanley Cup win in 2009; his playoff disasters against Montreal, Philadelphia, and the Islanders. The Penguins’ polite suggestions in the past for him to visit a sports psychologist suddenly became a requirement last offseason if he wanted to remain part of the organization. Fleury cooperated and came into training camp with a fresh mental and physical approach. Instead of relying on cross-crease lunges to move from shot to shot, Fleury now limits himself to short, efficient movements. Compare this clip from the Columbus series to Fleury circa 2007 in the video above. Fleury stays contained in his blue crease, shuffling side to side and never out of position when the puck rebounds or deflects to a different angle. He’s still capable of diving to make a desperate save, but isn’t rolling around like a ball of yellow goalie pads as he was on the first Meszaros goal in 2007. This is exactly what to look for if you want a tell-tale sign of Fleury’s mental state. When he unraveled against the Islanders, he started inching out of his crease, chasing pucks instead of having the patience to let them come to him. Fleury’s movements also get rigid when he’s nervous. In this clip above, you can almost feel the comfortable swagger he’s playing with as he darts smoothly from side to side and then scoops the puck into his glove. It looks like a goalie running through warmup motions prior to the game. Early in the Columbus series he was playing contained — this was probably drilled into his head by Bales — but looked rigid in his movements. When Fleury loosens up and allows his incredible athleticism to dictate his movements (without ending up outside the crease), he becomes very difficult to beat. The other change Fleury has made, specifically this season, has been his ability to track pucks through traffic. I’ve always marveled at how Los Angeles’ Jonathan Quick can play so compact, yet still be able to make unbelievable acrobatic saves. After noticing Fleury adopt a few of Quick’s tactics, I was finally able to understand what makes Quick so successful. 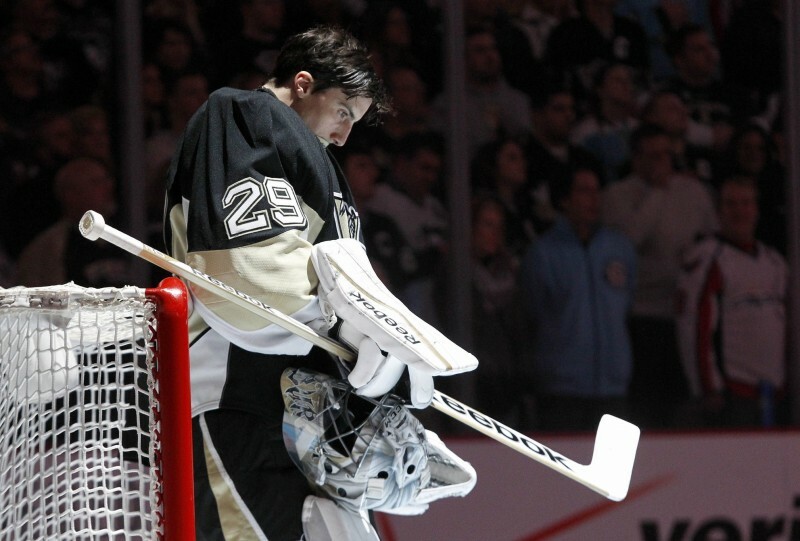 Quick (and now Fleury) stays very compact and even tucks his head into his shoulders like a turtle. This allows him to make his torso stand as tall as possible, but also makes it easier to see through traffic in front. At 6 foot 2, Fleury 2007 tried to look over the top of forwards in front to see point shots. Fleury 2014 stays lower. Legs are easier to see through than torsos, right? It also puts him in position to react to screened shots or deflections. If the puck is deflected to a forward standing on the side of the net, Fleury is primed and ready to explode to either side to make the desperation save. If Fleury needs to drop down to the butterfly, he’s close to the ice and hardly needs to move. Some goalies, such as Jonas Hiller and Anders Lindback, drop to the ice right away on any shot from the point. Others, like Henrik Lundqvist, stay on their feet as long as possible and expect teammates to block any shots along the ice. Fleury is somewhere in between now. He doesn’t drop to the ice as soon as he used to, which allows him to react to whatever happens to the puck between the blue line and the goal. The final change that’s been evident this season has been Fleury’s positioning on pucks behind the net. Part of his success has been a result of simply playing within his crease, maintaining his angles, and tracking back to his posts. He’s also adopted a new strategy for handling pucks below the goal line called Reverse or Reverse VH. Fleury gets caught outside of his posts far less often now. He also added a new technique to seal the posts off against attacks from along or below the goal line. Instead of his old preference for VH (the V stands for “vertical” because the short-side pad is upright against the post and the H is for “horizontal” as the back pad is down on the ice parallel to the goal line), Fleury now uses a technique called “Reverse” for most post-integration plays. With the Reverse, the lead pad is along the ice against the inside of post, with the torso and shoulders leaning into the iron. The back pad is just off the ice along the goal line and the back skate is pushing the body into that post seal. In addition to being a less locked up, “blocking” technique than VH, the Reverse keeps more of Fleury’s body between the posts rather than right on, and even outside, the post, providing more coverage even before pushing off on passes into the middle or across. We’ve talked up Fleury in this piece to the point where he should be set to win the next five Vezina Trophies, right? Let’s be honest. Fleury still has some weaknesses. Don’t shoot high: Despite all the lingering questions dogging him after last spring’s meltdown, Penguins goaltender Marc-Andre Fleury has been outstanding of late, recording two straight shutouts for Pittsburgh. The Rangers will have to switch things up against the 29-year-old netminder, and they got a useful tip from an unlikely source recently. According to Vigneault, Penguins team owner Mario Lemieux told Rangers assistant coach Ulf Samuelsson that “Anything Fleury can catch, he will catch.” Fleury did make a number of superb glove saves against New York, so look for the Blueshirts to drive the net and create more traffic in front, looking for better rebound chances. Maybe Lemieux was engaging in a little gamesmanship with old buddy Ulf, but I think Fleury still struggles quite a bit with shots over his left shoulder. Fleury’s contained approach also means he plays a blocking style that creates a lot of rebounds and second chance opportunities. Half of the goals Fleury has allowed this postseason have been off rebounds. The Penguins’ skaters collapse in front of their own net more this season and they’ll need to clean up loose pucks effectively if Fleury continues to generate such a high volume of rebounds. Fleury may not be perfect and the Penguins may not extend his contract beyond next season, but he’s been receptive to advice and reinvented his game after that disaster of inexperience in 2007. The stress of playoff hockey won’t disappear. The screened shots from the point won’t either. But these days, Fleury seems a little more equipped to handle both.